The next version of the process started in previous post. The code randomly places a 10px x 10px black cell in one 10px column of each 10px row but not in the same column as any of the previous 5 cells. 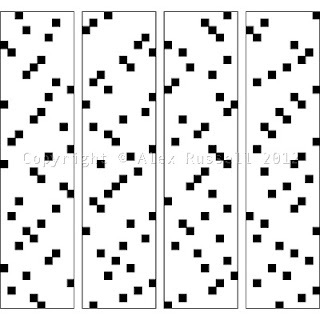 The intention here is to use a cellular automata model to create a sateen-style pattern (there's a definition of sateen repeat at the end of a previous post). A cell cannot go black unless the five cells above it are clear. The coding is done with a couple of one-dimensional arrays. The first holds the positions a black cell could occupy (those with five or more empty cells above) and the second has the positions that cannot be used (because there are four or less empty cells above it). As each row gets its new black cell, both arrays update to reflect the subsequent row's black cell possibilities.